The vCamMX is a portable all-in-one mini CCTV inspection system for viewing the internal condition of pipes, conduits, ducts and similar tubes between 25 and 100 mm diameter. The control module houses the 8” daylight-viewable LCD screen which displays the images from the remote camera, attached to the ﬂexible pushrod. The LCD displays the distance of pushrod deployed, as well as the current time and date. The system records in “avi” video format and takes pictures in JPEG format directly to a USB thumb-drive and can be instantly backed up to an SD card. The internal microphone allows the user to add audio commenting over reordered to highlight sections of the video and aid in identifying the video. Flexible pushrod is available in either 30 or 45 meter lengths. The pushrod is traceable with the use of an external pipe and cable locator transmitter and a locatable dual frequency sonde comes as standard equipment. A choice of two camera heads is available and the camera heads are interchangeable by the user in the field. The smaller camera is the model D18-MX which is fixed position and 18mm in diameter. The model D26-MX is self-leveling and 26mm in diameter. 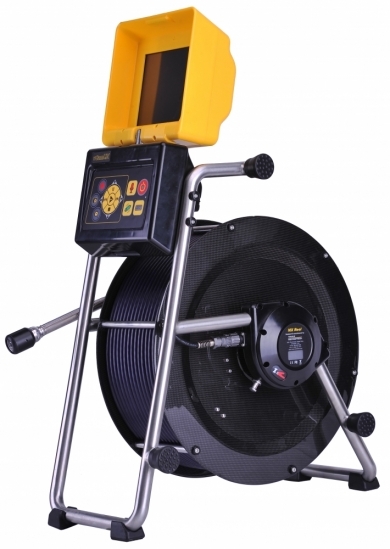 The MX reel can be purchased without the control module LCD and used with the existing vCam-5 control module.